One of the best ways to accompany a simple main course is with a delicious and complex salad. This recipe combines some of the healthiest greens with additions like fruit and almonds to create a flavor that’s fairly neutral yet nuanced. It’s a vegetarian-friendly side as well, so if you are trying to eat a Paleo diet with limited proteins, this a fantastic dish. We love this as part of a main course or as a prepared-in-advance salad for lunch – just remember to keep your dressing separate from your greens until you’re ready to eat to enjoy anytime during your day! 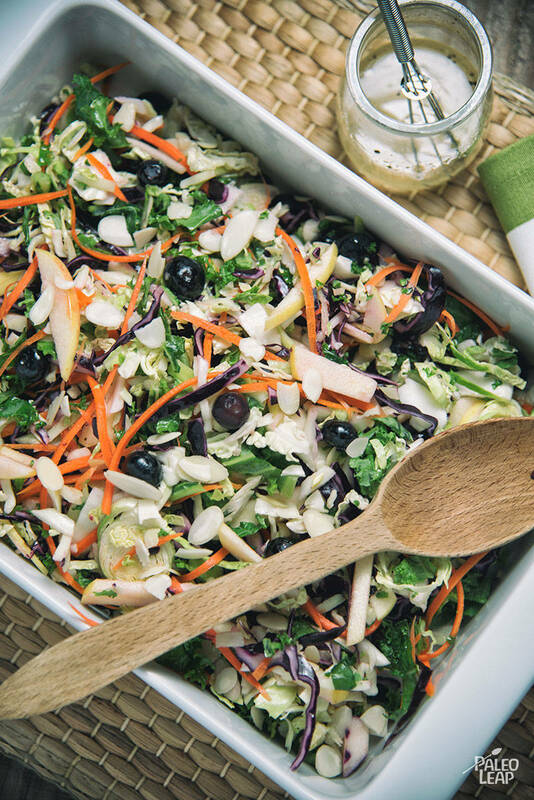 Unlike so many traditional salad recipes that rely on plain lettuce as the base, this dish is really centered on the use of cabbage and kale. You can certainly shift your ratios of these depending on your preferences and what you have available, but we like to include both for a few reasons. Cabbage, for example, is associated with higher levels of the antioxidant glutathione, and kale (regarded by many as a “super-food”) is packed with Vitamins A, C, and K – all essential for a balanced diet. With salads, there’s always a trade-off to consider – more expensive, pre-shredded greens, or the more time-consuming heads you find in the produce section. One of our favorite techniques to save money and time is to buy the larger heads and break out the food processor – this keeps preparation fairly quick and lowers your cost significantly. If you’re serving this dish with dinner, consider pairing with the Cajun Chicken with Blueberry Sauce to tie your salad and main dish flavors together nicely. In a salad bowl, combine the green cabbage, red cabbage, carrots, kale, apple, and blueberries. In a bowl, whisk the olive oil, apple cider vinegar, honey, and lemon juice; season to taste with salt and pepper. Drizzle the vinaigrette over the kale salad and toss until well blended. Serve the salad topped with slivered almonds.